It was with some hesitancy I decided last year to take the VitalTalk Faculty Development course. Why the hesitancy? Honestly, I thought to myself that I've been doing palliative care for over a decade. I've taught fellows, residents, medical students, and a whole host of other health care professionals. I've wrote book chapters on this stuff. Plus, I've read everything that I could get my hands on from the VitalTalk creators Tony Back, James Tulsky, and Bob Arnold. What, I thought, am I going to get out of this? As it turned out, a lot. 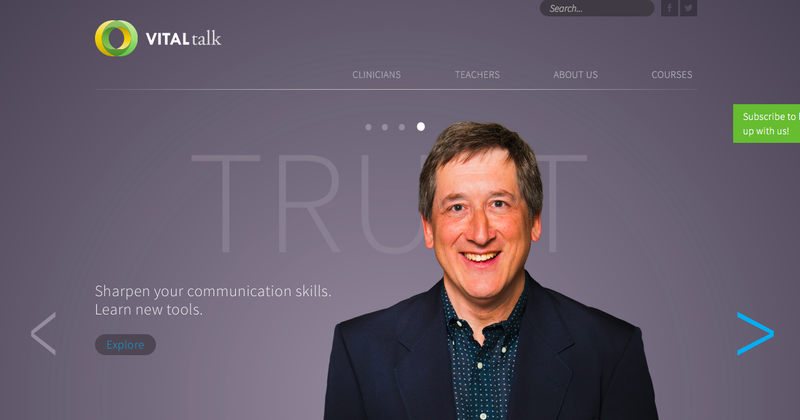 VitalTalk changed the way I teach communication. As one example, any of my fellows that I work with can now recite word for word the questions that they know I'll be asking at the end of a family meeting: "What is one thing that went well that you want to continue" and "what one thing do you want to do differently in the future?" These questions are part of the goal I set for myself at VitalTalk to change my feedback to one that rambled on for 15 minutes to one that is brief, specific, learner centric and future-oriented. And you know what? It works! 3. VitalTalk online course: This is a new, interactive online course arranged around a series of 15 modules. In addition to a videos and other instructional tools, participants are partnered with VitalTalk mentors who give individualized feedback on their communication skills. Still not convinced? Check out the VitalTalk website for more information, or check out this previous post on how not to use these communication skills at home!